Episode 009 – How Should I Clean My Email List? Do you have a lot of email addresses on your file that aren’t responding? Speaking from personal experience, Jeremy explains to Grant the steps to re-engage email subscribers and what to do if they continue to be unresponsive. Do you have people on your email list who haven’t interacted with your organization in some time? Do you want to learn you can save these people, and reactivate them so they’re still interested in receiving your emails? Today we’re going to hear a question from an organization who has this very problem. They have a large email list of people who haven’t interacted with the organization in over 18 months. We’re going to explore eight steps that the organization can take to reactivate these people, and then what decision you need to make to decide what to do with them if they aren’t still interested in receiving your emails. But before we bring Grant on with this question, I’d like to ask for your help. Will you please take a moment and rate, and post an honest review about Nonprofit Answers on iTunes or your favorite podcast service? 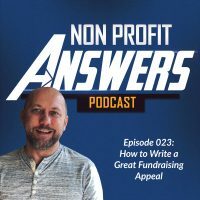 Your rating and review helps this podcast move up on the charts with Apple, so more nonprofit fundraisers and marketers will get a chance to have their questions answered. If you have a question that you’d like me to answer, please visit nonprofitanswers.org and submit your question. Thanks so much. And now Grant with his question. My name is Grant. And I’ve got a question about reactivating email addresses. I’m new to the organization, but they’ve been around for a long time and have about 75,000 emails on their list, with about 50,000 of those having not opened an email the last 18 months. I don’t want all that dead weight around, but my boss doesn’t want to lose them. He asked for some ideas on reactivating them before we delete them. What should we do? Grant, thank you for your question. Your approach to tackle this problem is wise. If a large portion of your email list isn’t interacting with your emails, which I’ll define as opening the emails, then you should remove them from email sends. Email providers like Gmail or Yahoo, they look at how many people aren’t interacting with your emails, and they will begin to suppress your emails or move you to a promotional tab. When this happens, legitimate recipients who want to read your emails will stop seeing them. This doesn’t help you, or the people who are interested in receiving your emails. You should do something about this problem, but there are some steps you can take to try this save these recipients. So we’re going to walk through eight of these steps that your organization can take to save the recipients in your email file so that they’ll continue receiving your emails and reengage with you. So first you can segment your emails. So you need to know how big your problem is. First I recommend segmenting off the people who haven’t open your emails in some period of time. You know this period of time is really defined by you and your organization. In your question, you mentioned 18 months, I agree this is a good time period that people should engage with you. If they haven’t engagement with you in 18 months, then they’re probably not going to. If someone hasn’t an opened one of your emails in 18 months, they aren’t likely ever going to without some prodding. If you want to be aggressive, you could tighten that down to about 12 months. So now that you have a segment of the people who haven’t open one of your emails and 18 months, you need to separate it as donors and non-donors. This is important as the people who have given to your organization are a different group. They behave differently, they think differently than someone whose just subscribed to your list but has never transacted. And you’ll find out here in a second what we’re going to do things people how to treat them differently. You could further break this down into a timeframe. So donors who haven’t donated or opened an email the last 18 months in one list, and donors have given in the last 18 months, but have not opened an email that timeframe in another list. I would not recommend removing that latter list from email list. If someone is a current donor, leave them on your email list. So how do I segment my list? It’s a great question. So most email providers allow you to query your email list for certain criteria. If you have your donors and non-donors in two different lists, then you can simply query those recipients who have opened an email in the past 18 months, and then mail to them. If you have donors and non-donors in the same list, so let’s say they’re all mixed together into one big general list, then what you need is a column of data, like account number, or a flag that marks them as donor or a non-donor that designates who is and isn’t a donor. And then you’ll be able to query people based on that information. So within your email service provider, you should have the ability to query and separate your emails out into different segments of different types of people. If you don’t, look for a different email service provider. Second, you want to test different email providers, different people that provide the email to your donors and to your subscribers. And so people may not be opening your emails because they’re not seeing them. It may have nothing to do with your content, or whether or not someone likes the continent of your emails, it just may be that the emails aren’t making it into the recipients inbox. At Food for the Hungry we tested this and found that on some email providers like Gmail, we see a noticeable improvement when we move to all text emails with fewer graphics. The theory is, is that the graphics cause email to go to the promotions tab, which if it’s an all text email, ends up in the inbox. So you’ll want to test this. You want to test sending different types of emails to see if you get different responses from people by seeing if you can get your emails into their inbox versus the promotions tab, or in some cases with some email providers, in the spam folder. For this you’ll need to send different email versions to different email addresses by querying based on the email address. As I mentioned earlier, most email service providers allow you to query, or to send emails to a queried list of email addresses. In this case, in my example, we might query people based on if their email address ends in @gmail.com. Third, you can create a save funnel. So you can create a series of emails that you send to people who haven’t open your emails in 18 months. This series of emails can be any number you want, I recommend at least three emails. The first email will be a subject line of, “We miss you” and then their first name. The content of the email is about how much you miss the recipient, and hope that they’ll reengage with your organization. For non-opens of the first email, people who don’t open that first email, you want to send a second email that has a subject line or something like, “First name, beneficiary name needs you” so you can use a story of someone that is a beneficiary of yours and send it to an email recipients so you’re going to put their first name, and then put a beneficiaries name. So for example, “Jeremy, Yasmine needs you.” The content of this email is a story about a beneficiary and how people like the email recipient help to the beneficiary. So someone like the recipient help the beneficiary. If you have a group of people then that don’t open that email, then the final email in the series has a subject line of something like, “Please don’t go.” The content of the final email thanks the recipient, and tells them that the organization respects them, and you’ll be sending them less email in the future. This save funnel is an effective way of re-engaging your email list. Fourth, you can offer your file a digital premium. So you offer subscribers a digital premium to reengage with your emails. Now this could be a e-book, a video, or perhaps you have a partner who’s a musical artist where you can give them an MP3, any kind of digital premium that is enticing enough for someone to want to continue to receive your emails. The best premiums are congruent to your nonprofit’s cause. Meaning the best digital premiums have a connection to what your cause is. When you send them things or offer them things that aren’t related to your cause, then you’ll probably end up still losing those people on your email list. They probably won’t be interested in continuing to receive your emails if the offer that you are used to reengage them doesn’t really speak to their heart for your cause. Fifth, offer them a physical premium. You can also use a physical premium, something like a real book, a coffee mug, a little trinket that is produced by some of your beneficiaries. You can use this physical premium to retain people, but I recommend due to the cost of doing this, that this is reserved for the donors on your file who have not engaged in email for some time. As I mentioned, a physical premium, kind of like a loaded coffee mug, a small token related to your work, these can be a useful tool reengage donors. We did this at Food for the Hungry with a logo coffee mug in the winter, and we saw several hundred people reengage with our email list. Now, this only went to our donors that were not engaged in our emails. Six, you can use multichannel communications to reengage people. So if you want to reengage people in email you may have the wrong email address, you might be, as I mentioned, in like a promotions tab, you might be unseen in their inbox, so you can use something that is multichannel in order to reach people. So another tactic is to reach out to the person via postcard, a phone call, if you have that other contact information from them. This could be as simple as communications update postcard, or phone call asking for someone’s current contact information. Reaching them in another channel affords you an opportunity to thank them for their support, and to tell them a story of the work that you’re doing. Seven, use a survey. People want to know that they are valued and listened to. A survey provides them this opportunity. You can use a survey to discover how someone feels about your organization, what causes they are passionate about, to discover new, more reliable contact information, and to reengage them with content that matches their interests. When you tag your email recipients by interest, you can segment your emails in the future so people will receive communications that align with their interests. And so many email service providers have a function where you can tag someone based on a form that they fill out, or based on their activity, or based on as we used to hear here, our survey result. Finally, number eight, we can move people to the inactive list or we can delete them. Once you’ve exhausted this list and a group of people have not reactivated on your email list, you have a choice. You can move them to the inactive list, or you can simply delete them. Keeping inactives in your email service provider simply costs you money. So I recommend removing them from your list entirely. If they haven’t responded to this the reactivation process, they are not likely to ever respond. Now this could be difficult to accept because it’s really hard when you have an email list to actually remove people from your list. But for the health of your file, and for the health of deliverability to the people that are interested in your emails, then you need to be willing to let some people go. Doesn’t mean that for donors that you need to remove them entirely from your donor database, that you can never stop communicating with them, just means that if they’re not likely to respond to email, there’s no reason to continue sending them email. Grant, thanks again for your question. Reengaging your email recipients is such an important step in the process of cleaning your email file. If you aren’t able to reengage them, I do recommend slowing down the emails to them so perhaps you just send one quarterly, or removing them from your send entirely like we just talked about. So I’ve been getting some great feedback on the Nonprofit Answers Podcast, and really appreciate your time listening today. And as I mentioned earlier, it’d be great if you can take a moment and leave a rating and review over in iTunes or your favorite podcast service. Thanks so much.